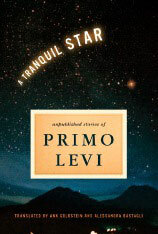 A Tranquil Star – Unpublished Stories, by Primo Levi is quite the collection of seventeen short stories within a 164 page count. Levi is well-known for his Holocaust memoirs, but in this book of short stories, he goes beyond the Holocaust, into the world of the his deep imagination, bringing us parables of the metaphysical order. Levi has written in not so subtle words the reality of our world. We might initially not understand this collection of often horrid, bizarre and violent stories, but if we stop to think about what we are reading, it becomes clear that Levi is giving us issues to ponder. In the realm and reality of things, our world is filled with casual murders, robberies, bombings, people who look at death as entertainment, people with lack of esteem, individuals with huge egos unable to cope in a new land, and the acts and repercussions of war. Levi clearly, and with insight, has written about the humanity of our world, or, appropriately, the lack of humanity in some cases. The positives and negatives are entwined, in The Tranquil Star, to point of negativity often overcoming the positive. If you take away nothing else from The Tranquil Star, you will see the inhumanity of individuals, the uncaring attitudes and unwillingness to bend towards being humane individuals. Levi’s insight is intense, his word images often much too descriptive (in the sense of his bringing horror to our minds), and his prose strong and vivid. Don’t get me wrong, there is lightness and humor in some of the stories, but the majority are a commentary on the universal flow. He wraps up the world, within short stories (some only six pages long), in a concise and descriptive manner, filling our eyes and minds with overwhelming visuals. The stories are a strong assessment of the fragility of our lives and world. Levi infuses the preciousness of humanity within the pages, even when the negative is strong. In my opinion that is Levi’s message…life is precious and fragile. Primo Levi was a masterful story teller, blending fantasy into the reality of our world, as we know it. The Tranquil Star is evidence of that. “Flory – A Miraculous Story of Survival“, by Flory Van Beek, is an incredible and compelling memoir. Flory Van Beek speaks from her heart, her soul illuminating each page, creating word-imagery filled with life survival in Holland during the Holocaust. I could not put “Flory” down, and read it straight through, memsmerized by the incredible depiction of daily life endured during the German occupation of Holland. From her childhood years, before World War II began, through her marriage as a young adult, during the Holocaust, Flory Van Beek speaks volumes within each line, in her emotional descriptions of the minutes, hours, days, and unbelievable five-year ordeal endured in hiding. Her detail to the historical aspect is infused by a collection of diaries, letters, newpaper articles, documents and other items, that she saved for their importance in documenting Holocaust events and the German occupation of Holland. The collection was saved in metal boxes and hidden in the ground of the yard of their “benefactors” . Flory and her husband were hidden by more than one special family. These families were not Jewish. They were not the only Jews hidden during that five-year ordeal, as the citizens of Holland were outraged by the Nazis and did their best to hide all Jews living in Holland. It is amazing to read the determination of not only a country, but a group of individuals who felt it their duty to save Jewish lives, without expecting any monetary gain, or without even expecting acknowledgement of their kind deeds. Not all Jews were able to be saved, and Flory Van Beek’s own mother was sent to the gas chamber, along with other relatives. “Flory – A Miraculous Story of Survival” is based on Flory Van Beek’s memory and based on all the documents that Flory Van Beek managed to save and hide. She wrote the testimonial book as a “sacred memory of my beloved mother and all family members who perished at the hands of the German Nazis in the greatest human tragedy the world has ever known”. We the reader are better off for having read this amazing memoir and testimonial, written through the eyes, diaries, memory, and the voice of Flory Van Beek, a witness to the historical events of the Holocaust and German Nazi occupation of Holland. Her voice is often emotional, and always articulate, and her story is one that had to be told. “Flory – A Miraculous Story of Survival“, is just that, miraculous, indeed, on many levels. It is a memoir I will remember, and never forget. Five Chimneys, by Olga Lengyel is an incredible and intense personal eyewitness accounting and Holocaust memoir. Five Chimneys was published in 1947, in English, two years after liberation, when Olga Lengyel’s mind and memories were still, fresh regarding the events she witnessed while a prisoner in Auschwitz. 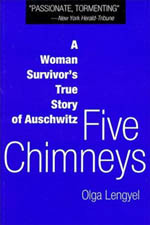 The title, Five Chimneys, stems from the five crematorium chimneys at Auschwitz-Birkenau. It isn’t enough that she witnessed the horrendous atrocities, but she also lost her family there. They all were exterminated in the gas chambers…her husband, two children and her parents. Her husband was under orders to be deported to Auschwitz. Olga Lengyel was determined, and went to the authorities insisting that she and her children be deported with him, as she assumed that he would be put to work in a hospital, as he was a medical doctor. She did not believe any of the stories she was told, about the actual situtation, and thought they were exaggerations. Her parents decided to go with her and the children, and the entire family went together. Little did she know it would result in the death of everyone, but her. Her memoir is often harsh and brutal, but so were the conditions she had to live under. Her writing is well-articulated, filled with extremely clear descriptives that make our skin crawl. She doesn’t seek sympathy, but rather wanted the realities and truth to be told. Olga Lengyel writes as if she is a reporter, with an unbiased-like mindset. As a survivor and a witness, she reports what she, herself, experienced, and what she saw. The facts and truth of the events are what motivated her to stay alive, when everyone she loved had been murdered. What Olga Lengyel witnessed and went through in Auschwitz, nobody should ever have to be a witness to, or have to endure. From watching the crematorium workers load several bodies into the large ovens at once, to having to pile dead bodies atop one another…herself, to standing naked for hours in the freezing cold while waiting for roll call, to the beatings, to lack of food, and having to eliminate in a bucket…the same one used to eat in, and to the unbelievably horrific events that pregnant women went through, etc., the book is intense testimony to the brutality and inhumanity of man. It is also a testament to Olga Lengyel’s strength and courage during the extreme circumstances she endured (that is putting it mildly). Her motivation for survival was the necessity to bear witness to the atrocious inhumanity of the Nazi Germans. Albert Einstein, himself, read Five Chimneys, and actually wrote a letter to Olga Lengyl. Part of that letter is included in the book. The infusion of such atrocities, in great numbers, into one memoir is beyond belief, as Olga Lengyel manages to describe with graphic clarity the most minute detail of daily existence (if you can call it that) in the Women’s camp at Auschwitz. She leaves nothing to the imagination, and each atrocious act is written boldly, powerfully, concise and to the point, no stone left unturned. Five Chimneys is heart wrenching, horrific, and overwhelming. It is not for the weak of heart or weak of stomach. Olga Lengyel’s Five Chimneys describes the essence of man’s inhumanity, and is a memoir that should be read with that in mind, as her overpowering documentation of the nighmares she experienced and witnessed is not coated over, in any fashion. The book is extremely haunting. Olag Lengyel died at the age of 90, in 2001. Olga Lengyel’s spirit and strength will survive through time, within the pages of her extraordinary memoir, Five Chimneys. “The Dream“: A Memoir, by Harry Bernstein, is Bernstein’s follow-up memoir to his critically acclaimed “The Invisible Wall“, which I read and reviewed, when it was first published. When I saw “The Dream” on the shelf of newly released books, in the book store, I grabbed it immediately, because I was enthralled with “The Invisible Wall” immensely. I am not sorry I did, as reading the book paints a picture of America both before and post-depression era. In particular, “The Dream” focuses on the hardship Bernstein’s family went through, both physically, socially, emotionally and mentally. The family members that made up Bernstein’s family are as different as they are alike. Each member relates to the whole, each member’s personality a reflection of their harsh and abusive environment. The dominant force within the family was Bernstein’s mother, the ever protective mother, the one who held the family together during times of crisis, and held the family together from her emotionally abusive husband. Bernstein’s father was an alcoholic, a verbally, and sometimes physically, abusive man, who kept the family hanging by monetary threads, as he doled out as little as possible in order for them to survive, and meet the essentials of food, clothing and shelter. He spent most of his earnings in pubs. His own father earned a living as a beggar in New York. This didn’t stop Bernstein’s mother from her goals and dreams. Bernstein’s mother had a dream, a dream to move to America and make a better life for herself and her children. When they were sent tickets (anonymously) to emigrate, she didn’t hesitate to leave. She envisioned a new beginning, a life of opportunity. Without those tickets, and subsequent events, Bernstein would never have met his beloved wife, Ruby. They were married for 67-years, before her death in 2002. Their courtship and romance is deeply touching. Although 98-years in age, Bernstein’s mind is as cognizant as that of a much younger person. His wit, poignancy and incredible word paintings fill the pages of “The Dream“, flowing from one scenario to the next. Bernstein’s zest for life is apparent throughout the book. He brings us not only a compelling memoir, but an accounting of a dysfunctional family, within the confines of Chicago and New York during the 1920s and 1930s. “The Dream” is an inspiration to all of us, each sentence written with emotion, strength, eloquence and brilliance. Harry Bernstein, himself, is an inspiration to all of us. If you read “The Invisible Wall“, you must read “The Dream“. It will not disappoint you. If you didn’t read “The Invisible Wall“, I suggest you do so, but in any event, definitely read “The Dream“. “A Late Divorce”, by A.B. Yehoshua, is a novel that was translated from the Hebrew by Hillel Halkin. The story line revolves around Yehuda and his wife Naomi. Yehuda has traveled back to Israel from America, in order to obtain a divorce from his wife, Naomi. Here is where the tour-de-force begins. “A Late Divorce”, in my opinion, has a dual purpose, and is a true tour-de-force novel with its story lines regarding family dynamics, within the tapestry of the State of Israel, a country whose own threads encompass its own state of being, culturally, emotionally, physically and geographically. Obtaining the divorce requires strength, and is no easy feat for Yehuda, and his determination has thrown his family members into a state of emotional turmoil. The book takes place over a period of nine days that lead up to the Passover celebration. Each day (a chapter in the book) is devoted to one family member’s perspective, not only on the divorce, but family life in general, and how they remember Yehuda’s time spent with them. Yehosua is masterful in his ability to get inside the human mind, and see life through nine family members, each bringing a different analysis to the current familial situation. For some, the situation is unbearable, and for others, daily verbal assaults and torture is a way of life, thinly disguised as joking. We have the character of Gaddi on Sunday, a seven-year old, and grandson of Yehuda. We are privvy to his thoughts within his racing mind, and Yehoshua is ingenious in the way he presents Gaddi, unarticulated, fast talking, thoughts running from one subject to the next. Yet, within his immaturity, we also see a Gaddi who seems persceptive, and a child who exhibits emotions turned inward. Monday brings us Yisra’el Kedmi, Yehuda’s son-in-law, married to Ya’el. He is called Kedmi, as he feels one Israel is enough. Kedmi is more of an “out-law” than an in-law. He is the “jokester”, the one who demonstrates passive-aggressive behavior through his obnoxious and snide remarks. Yet, he might just be the sanest of the bunch. Tuesday is Dina’s day. She is Asi’s wife, and Asi is the son of Yehuda. She is an only child of Hungarian parents, who are Hasidic Jews, who are constantly at her for not having children, yet. Dina is an aspiring writer. Her writing is her family, each page is like one of her children. Wednesday is Asi’s voice, one that is told in an environment of sadness. Asi has a passion for 19th century terrorists, and he lectures at the university. He has a compulsion that is harmful to him, and it began when he was a child. Asi acts superior to his wife, Dina, and treats her as if she is a child. He has yet to fulfill his marriage bed. Thursday we hear a one-sided conversation that Refa’el Calderon has with Tsvi. Tsvi is Yehuda’s son, and Refa’el is Tsvi’s current lover. Not only is the conversation one-sided, but so is the relationship, as Tsvi treats Refa’el with extreme disrespect. Refa’el is of Sephardic Jewish heritage. Friday is the day that Tsvi meets with is therapist, right before Shabbat evening prayer service begins. He is an extremely manipulative person, and is always looking for an easy and quick way to make money, even if it is at another’s expense. He lives in Tel Aviv. Saturday is not only the Sabbath, but is a day that takes place three years into the future. We are seeing the day through Ya’el’s mind and eyes, as she tries to focus on the past and remember what events occurred. What tragic incident happened that has caused her to block her memory of the day. Ya’el has been the quiet force in the family, always trying to please. Also, in this chapter we are introduced to Connie, who was Yehuda’s bride-to-be, and their son. In this chapter we realize what the ending to the story will be. Sunday is the day of the Passover Seder, and we meet Naomi, Yehuda’s wife. She has been confined to a mental hospital ever since she stabbed Yehuda. She has been labeled as crazy, although I am not so sure that she is. She has many coherent and cognizant moments, more than other family members. Monday is Yehuda’s story, his memories and perspectives. We begin to see the overall picture in this chapter more clearly. And, we realize who is manipulative, and who is trying to drive the other to madness. The greed and guilt combine, bringing out emotions that were harbored and festered to a crescendo of an ending. The stories within the chapters of “A Late Divorce” are a metaphor for dysfunctional family relationships and interactions, and a metaphor for the daily lives and dynamics that make up the fabric of Israel’s very core. We see the comparison through Yehoshua’s characters. “A Late Divorce” is a story of sadness and humor, both, yet the sadness is dominant, as each family member tries to heal the family as a unit, as a whole, and put it back together, failing in their endeavors. There is never peace, in any situation, and each family member is constantly on guard, often on guard for the unknown and unseen, as if awaiting disaster. Each voice is a thread in the fabric of the whole, the complete tapestry is told with the incomparable voice and brilliance of A.B. Yehoshua. He is masterful in his word visuals, and brings incredible insight into the human mind and emotions, blending both in a concise and astute vision of both family and the State of Israel.